This is good to know as I always thought the longest reel was around 150m for duct use, are there any other lengths available between 150m and 350m for ducts use? if using a connectorised reel, can it connect from the CBT straight to the ONT without the need for a CSP (in my case the fibre feed will come straight into an equipment room via duct not through an outside wall)? Starts thinking about fibre direct to each cottage! You've clearly got all the skills for running the ducts from your server room to the properties! I can make some suggestions for connecting it up if you like - Campus Networking is one of my things. They are all connected already just via ubiquiti nanoobeams running wireless links at 330MB to three cottage blocks, then a a UniFi AP in each cottage. But I was more thinking run fibre direct to each cottage and pay for multiple links, giving each cottage 80/20 or more! Digging the central courtyard up would be horrible as it is full of main drains, surface water drains, and electric pipes, although only a gravel finish, the amount of under ground stuff would result i na fair bit of hand trenching. But if we go faster than 330/50 up to 500 or 1G then the three links are looking small. One block has three APs, for three cottages, 18-beds between them. If it was ducted and cabled in CAT6 (or 5e at a push) then it would do 1Gbps allowing all bandwidth to pushed to each block if the demand was there. Bud if Openreach fitted the DP on site I could even run fibre direct! The links are good for now, but as some point won't be, a single domestic router providing wifi only in reception was good for everyone once. 160 to 350, that�s it as far as I am aware. Yes. That�s exactly how it�s meant to be connected. It's fantastic that you are going to all this work and expense for your holiday cottages. I recently stayed somewhere that had FTTP available to order, but there was just very limited and patchy WiFi on site. I had to use my phone for tethering with it propped up in a window. I often use the Internet to find places to visit, pubs restaurants etc. As well as catching up with the forums in the morning/evenings, and my two daughters are always on the net. So decent WiFi is something I always look for when booking places. Why pay BT multiple times, when you can serve all the buildings from a single fast link? Your main link is presumably 330/30 or 330/50, and in future may be upgradeable to 1000/220. What I don't quite follow is: why using BT to deliver fibre to the properties would be different in this regard than running your own fibre. Don't run copper between buildings - it's dangerous. If there's a thunderstorm storm nearby, it can induce a large potential difference between buildings, which at best fries the electronics, and at worst will kill someone. If you *must* use copper between buildings then install a CAT5-specific lightening arrestor at each end, and have it properly earthed by an electrician. But really, fibre is the way to go. If you run your own fibre pair to each building or cluster of buildings, you can run these at 1Gbps cheaply, and upgrade in future to 10G or higher. Use single-mode fibre (OS2), which is the same as telcos use: essentially unlimited distance and speed, and it's actually cheaper than multi-mode which is not as good. You connect it to an 1000baseLX SFP at each end. At each building you need a switch which has an SFP port. The Netgear GS110TP is very nice for this: it has 2 SFP and 8 copper, and the 8 copper all drive PoE so can be used to power your APs without power injectors (*). It can be monitored via SNMP, and has web and telnet CLI (**). The nice thing about the Mikrotik being a proper multi-port router is that you can give each building its own subnet and route between them. This means that a network problem in one building (e.g. a broadcast storm) does not affect the other buildings. You can also apply ACLs, e.g. to stop a guest in one building from attempting to attack or spread viruses to guests in other buildings. Ideally each building would have its own fibre pair back to the central router. Although the Netgear has two SFP ports, avoid the temptation to daisy-chain from one Netgear to another to another. Your network will end up really unreliable, and if there's a problem it will be almost impossible to debug. However it's OK to join fibres together to make a path. For example, let's say you have a cluster of 4 buildings. You can run an 8-strand cable to building A, and 2-strand cables from A to B, A to C and A to D. Then you join them together at A, so physically you have a mini star around building A, but buildings A-D each have a separate fibre pair back to your server room. In practice this isn't always possible, and one level of daisy chaining is OK. So if building A had a switch with four SFP ports, you could run run connections from switch A to switch B, switch A to switch C, and switch A to switch D. It's less optimal: all four buildings will be on the same subnet, and if switch A fails or loses power, buildings B-D will all lose service as well. You will either need a friendly fibre contractor on hand, or you will need to get pre-made cables of the right length. Armoured cables can be directly buried. Even with ducts, you want to be careful of rats chewing the cables; after pulling cables plug the ducts with a cement plug. If this stuff interests you, then you might want to look at this and this. If this is not of interest, then for an easy life you install separate Openreach services to each property, but at N x £30 per month it will add up. (*) The power is standard PoE 802.3af. Most APs work fine with this, e.g. Unifi AC Lite. The old Unifi AC Pro needed higher power "PoE+" 802.3at, and don't work reliability on the Netgear. Because it is simple! 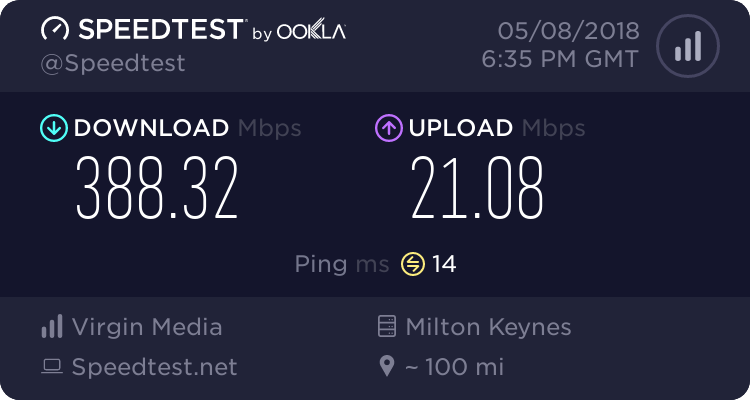 And as no-one offers 1000/220 over Openreach - except maybe spectrum I was thinking 80/20 connections as being enough for a pair of cottages. It isn't but makes more bandwidth available now and each cottage could have a fairly simply router. Simple is good. All have same earths as from same main supply, but differences could occur. But yes agree, and we already have lightening arresters connected to earths at each end of the CAT5 for the nanobeams. Will read up, and if the opportunity to rip the car park up presents itself I might look at it. We already have Ubiquiti US-8-150W with two SFP ports per cottage block, that power the nanoobeams, and APs for each cottage. Each block is a single physical structure. with internal Cat5 from switch to APs. So it would just be ducting, entry into buildings and lengths of fibre to sort. And a head head with multiple fibre. I wonder how long it will be before we need it! 8k streaming? Anyone know who "Allocator" is? Apparently Openreach are chasing them for my install (just had my weekly update). I've requested my full survey.